A cooker hood protects your kitchen against all those nasty airborne grease and smoke particles, and keeps your home smelling fresh and damp-free. But in doing all of this good work, a cooker hood takes its fair share of punishment. It therefore requires regular maintenance if it’s to remain effective at protecting your kitchen. Let’s take a closer look at what this maintenance might consist of. First, mix a couple of teaspoons of bicarbonate of soda into some boiling water. Next, gently wash the solution over the top of the hood using a sponge. This should loosen the grease and get it moving, so that it can be removed. 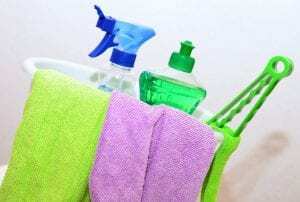 There are many different cleaning products which are designed specifically to tackle steel surfaces. Make use of these. Spray across the top of the hood and wipe with a gentle cloth, like a jay-cloth or soft sponge. Avoid harsh brushes, especially wire ones – these will mark the steel. If you’re performing a deep clean, you’ll want to clean the underside of the hood, too. If there are any hard-to-reach crevices there, then an old, soft toothbrush can work wonders. Once you’ve done this, you’ll want to apply an extra coat of gloss to get the whole thing looking as shiny and new as possible. There are a few different ways of doing this – some advocate a smudge of WD40, whilst others prefer to apply baby oil. Either solution will rid the surface of greasy hand-marks and ensure a gleaming finish. As surfaces go, glass is a great deal more delicate than steel. Blemishes are much easier to inflict, and once they’re there, they’ll show up far more clearly. Bicarbonate of soda is just as useful when it comes to cleaning a glass cooker hood. It’s harsh enough to clean off that caked-on grease, yet not so harsh that it’ll destroy the glass. Mix a couple of heaped teaspoons into a bowl with boiling water, and use the soft cloth to wipe your new solution over the hood. Start with the top, and then move onto the underside. You can use your paper towels to remove the solution as you go. If you’ve done this correctly, the offending grease should be all but eradicated – but our job isn’t quite done. Next, apply a layer of glass cleaner and wipe with your jay-cloth. At this point, many suggest adding a layer of baby oil in order to achieve that immaculate shine, and remove any remaining fingerprints. 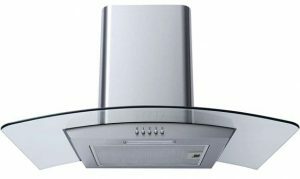 Check out our fantastic range of cooker hoods. With prices to suit every budget and interior, you can get free delivery when you buy online today! Whichever style of hood you’ve got, it will come with a metal grease filter. This mesh is designed to catch grease particles. Over time, this grease will accumulate to the point that it becomes dangerous. While many other sorts of filter (which we’ll come to later) are designed to be removed and replaced, grease filters are designed to be regularly cleaned. Mix a couple of heaped teaspoons of bicarbonate of soda with the degreasing soap, then pour on some hot water – the hotter the better. Boiling water from a kettle is ideal. Mix it well using your brush, and then submerge your filters. After a good ten-minute soak, the mixture should have loosened the grease to the point that you can scrub it off. You should now be looking at a sparkling clean filter. All that remains is to give it a rinse and dry with the paper towels, and to put it back in the hood. Obviously, the more often you do this, the less grease will have accumulated and the easier the task will be. Monthly washes are usually enough to keep a hood functioning at its best. Many designs can be washed in a dishwasher, but if you’re going to do that, you should do so before the grease really gets a chance to build up. This is because the cleaning cycle will likely distribute that grease over the rest of your washing up. 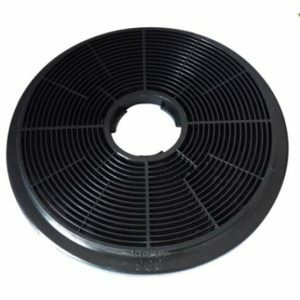 Charcoal filters are found only in cooker hoods designed to recirculate air. 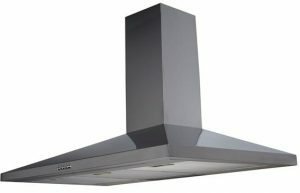 Extractor style hoods, that are designed to remove air from the hob and channel it outside, will not require them. Charcoal, or carbon filters, are a means of purifying the air that passes through them. This helps to eliminate unwanted smells. Carbon filters will eventually reach saturation point, at which point they’ll form a solid barrier through which air will be unable to pass. When this happens (or preferably, some time before) you’ll need to replace your carbon filter. How you do this depends on the design of the filter. Some consist of a rectangular sheet, which slots within a metal grease filter. Some attach to the motor which drives the fans. If you have a flat-style extractor, your grease filters might come in paper form. These styles of filter, like the charcoal filters we’ve just discussed, are designed to be removed and replaced rather than cleaned. Simply open up the hood and remove the filter paper. You’ll then be able to install a replacement. You may have to manually cut the paper to size, so be sure of how much you need before you get the scissors out! Previous Previous post: What is a Fan Oven?